Joplin, MO – Nearly 800 area high-school students will take the field with the Lion Pride Marching Band for a half-time performance on Thursday, Aug. 31, as the Lions open the 2017 football season vs. Fort Hays State at Fred G. Hughes Stadium. Chris Carter: 7 p.m., Webster Hall’s Corley Auditorium. The mentalist’s performance is sponsored by the Campus Activities Board. Free and open to the campus community. Archery Tag: 10:30 a.m. to 1:30 p.m., campus Oval. Similar to dodgeball, students will try to tag one another with foam-tipped arrows. Top 10 Things Everyone Should Know About Korea: 11 a.m., Corley Auditorium. Author and teacher Gary Wintz will offer an introduction to Korea – it’s people, history, politics and culture. Free and open to the public. 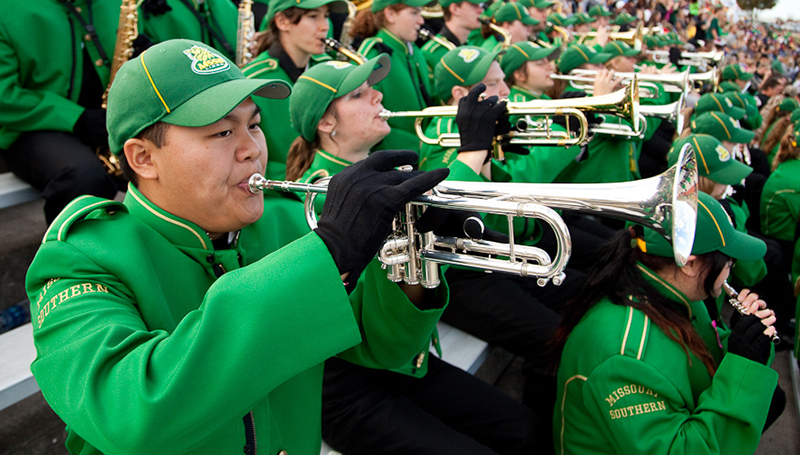 Mass Band Day: 7 p.m., Fred G. Hughes Stadium. Touring North Korea – Absolutely Fascinating (But is it Real? ): 9 a.m., Corley Auditorium. Gary Wintz has guided tours all over North Korea – a fascinating, if sometimes clearly staged and contrived experience for tourists. Free and open to the public. Religions and Spirituality on the Korean Peninsula: 11 a.m., Corley Auditorium. Wintz will offer insights into the historical evolution of religion in both North and South Korea. Free and open to the public.